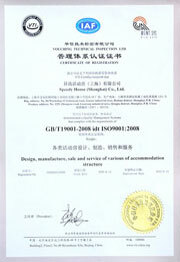 Speedy House (Shangai) CO., LTD. Speedy House (Shanghai) Co., Ltd., founded in 2006, operates on a land area of 40 acres in Liantang Industrial Park adjacent to Zhujiajiao Town, Qingpu District, Shanghai, 1 hour driving from the City centre. Speedy House has welding, painting, carpentry and kit-assembly shops and is equipped with cold-roll forming machines with computer/frequency-controlled and hydro form mould cutting-off as well as computer-controlled hydraulic benders and shears, shot blasting machine, paint and dry booths, wood working machineries like precision board-sawing machines, welding and handling equipment. Besides, it is staffed with 150 employees with long experience in the accommodation and container industry and therefore experts in marketing, design, production, quality control and in their transportation. 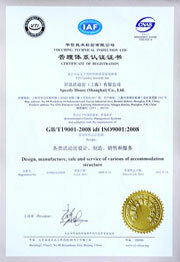 Speedy House annual output has reached 5000 TEU through years of unremitting efforts. Always bearing in mind the tenet “Quality is of essence, manage efficiently, loyalty to customers”, the company manages itself in accordance with “5S” mode and constantly develops new products to satisfy different domestic and foreign customers needs. Our Patented prefabricated houses can be offered in several materials combinations according to customer’s and environmental requirements. Because of their functionality, durability, easy and quick installation and removal, our products are gradually going global. 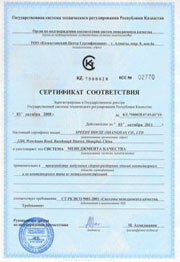 The company has been awarded with the “Kazakhstan Quality System Certification” in September 2008 and with “ISO9001/2008 Quality Management System Certification” on August 14, 2009. Following the motto “People-oriented, Development-driven”, the company spares no efforts to create high quality and environment friendly accommodation solutions at a competitive price and excellent service to customers.